The Reykjavik Marathon last weekend had 1,062 marathon finishers. 156 of them came from Iceland but 906 from other parts of the world! It is fantastic to see how much the marathon has grown in popularity, both among Icelanders and foreign guests as well. A total of 2,568 runners came from 57 countries to run in the three longest distances of the Reykjavik Marathon. In the full marathon the biggest number of runners came from the USA or 211. 179 came from Great Britain and 156 from Iceland. The marathon is gaining in popularity with the number of marathon runners increasing by 21% from the previous year. In the half marathon there were 1,116 runners from Iceland and 1,035 from other countries. 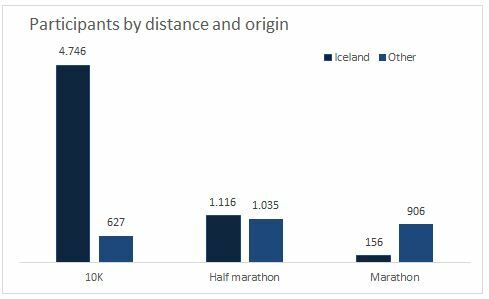 Total 8,586 runners finished the three longest distances (42.2, 21.1 and 10K), 2,568 of them from abroad.The 10K however was dominated number wise by 4,746 Icelanders, with 627 foreigners finishing the distance. 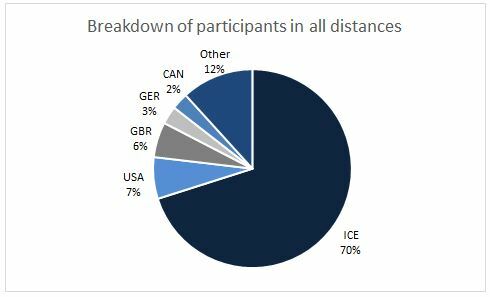 The graph below shows breakdown by country for the marathon, half marathon and 10K distances. 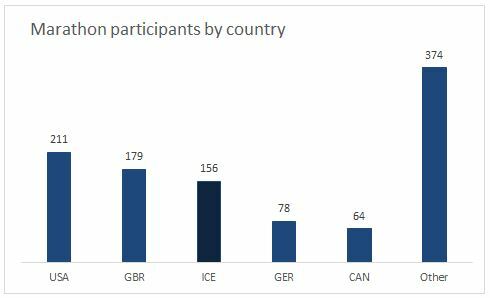 The foreign runners in the Reykjavik marathon came from no less than 57 countries. All Scandinavian countries and most European countries were represented but there were also runners from countries as far away as Brazil, Australia, China, India, Hong Kong and Japan.